I have 3 rooms that lose power on my main floor and 3 that still have power with no breakers being set off. One of the rooms is the kitchen but the stove still works. Actually when the power goes off in those 3 rooms and you turn on a stove burner the power immediately comes back on. I have changed almost all of the sockets in the 3 rooms and it has almost stopped completely but still goes off a few times a day. I have a few more to go and then will get into the breaker box I guess. Any other advice? You have lost a phase. Your stove, once switched on, is backfeeding through the phase that isn't working. 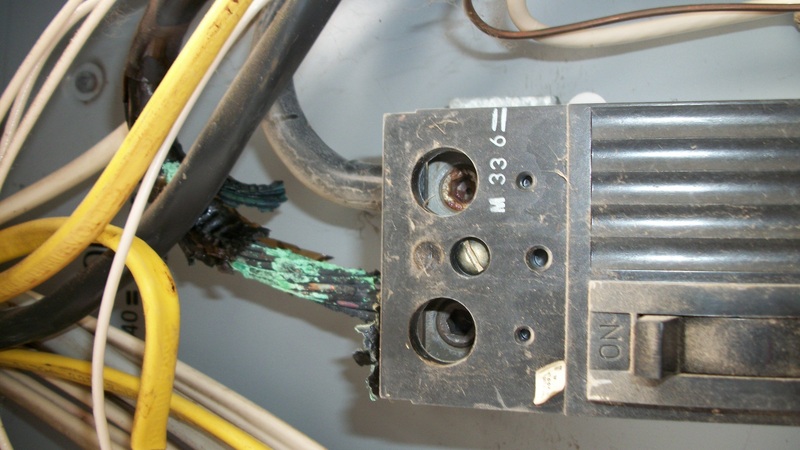 You are looking for a burnt lug or wiring probably in the meter base or panel. If you can't see any burnt or discoloring, you will need to turn off your stove and then check for voltage at the load side of all of your breakers. You're looking for something like this. I would only add that it is possible the phase has been lost at the Service or even on the pole. If a licensed (if you live in a licensed state) or at least qualified electrician puts a meter on the load side of the main breaker and finds a lost phase, but finds the expected phases coming in from the meter, then the problem is inside your house. If there aren't 240 volts coming in from the meter, then your problem is in the meter or at the pole. Either way, you'll probably need to get your local utility involved. Lighting went out in half of house? Why does electricity turn on and off in one part of my house? Why aren't my in-ground lights receiving power?